In short, Southwest America, 1885, a tough rural doctor/healer (Blanchett) gets a visit from her long gone deadbeat dad (Lee Jones) on the same day that her daughter goes missing. The production notes call it a "starkly beautiful" picture and besides being an "action-filled suspense thriller," they say it's also a "powerful drama of love, forgiveness and redemption." Initially, what interested me most were Tommy Lee-Jones (lead) and Ron Howard (directing). But, the picture disappointed me. I found it stark, but hardly beautiful. Though Tommy as the Indianized white man, and the perfectly cast daughter Dot (Jenna Boyd) are both strong, the film sounds very few emotionally-striking notes. And there is plenty of good opportunity for such emotion. Additionally, MISSING offers far less of an eerily supernaturalness than I'd expected. Lastly, I became frustrated with some sort of defeating blunder occurring every time a possible positive progression transpired. That said, the film does deliver on the action/suspense thriller promise. And to be fair, this is a genre that doesn't particularly excite me, so I must admit a pre-disposed bias. 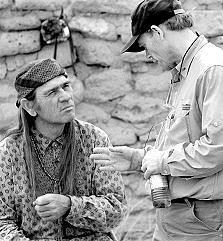 Howard says of Jones "Tommy Lee already had a vast knowledge of the old West and after studying for months with real Apache elders, for whom he showed the highest respect, be became fascinated with every detail of the culture. He was a champion of the Apache language, culture and psychology." The Missing. Copyright © 2003. Rated R.
Starring Tommy Lee Jones, Cate Blanchett, Evan Rachel Wood, Jenna Bod, Aaron Eckhart. Screenplay by Ken Kaufma, based on the novel "The Last Ride" by Thomas Eidson. Produced by Brian Grazer, Daniel Ostroff, Ron Howard at Revolution/Imagine/Columbia.